On October 31st, I wrote a post about a recent Democracy Corps Poll. That poll said the seniors are moving away from supporting the Republican Party, and toward supporting Democratic candidates. They surveyed seniors in the most competitive GOP districts and found this was true even in those districts. They found that seniors had moved away from the GOP and toward the Democrats by about 11% to 12%. This is important because seniors are registered to vote at higher levels than any other group, and tend to vote more often. And with other groups having already moved solidly into the Democratic camp (women, young people, Blacks, Hispanics, Asians, etc. ), the Republicans simply cannot afford to lose a substantial amount of voters -- especially in their most competitive districts (since the Democrats only need 17 seats to tip the House to their control). 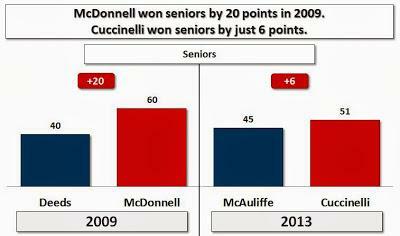 Now there is solid electoral evidence of that shift of seniors away from the Republican Party. Back in 2009, in the Virginia gubernatorial election, exit polls showed that senior voters had supported the GOP candidate by 60% (to 40% for the Democrat). The exits polls this year showed a rather dramatic shift. This year, even with a rather weak Democratic candidate, that margin of senior preference was much smaller -- 51% for the Republican and 45% for the Democrat, only a 6 point difference. That's a 14 point move away from the GOP in the last four years. Much like the most competitive Republican House districts, Virginia is competitive. While it used to be a red state, it is now more purple (available to either party), and this remarkable shift by senior voters made a big difference in what turned out to be a close election. It could do the same in the House races next year, especially if the Republicans cling to their anti-senior policies (such as privatizing Social Security and abolishing Medicare -- or cutting benefits to both). Gerrymandering will save many GOP House districts for them, but unless they staunch the flow of senior voters away from their party they could lose the House next year.